Confessions of an ADD English Teacher: Progress on stairs! Right now it is very tempting to be in a corner rocking back and forth. 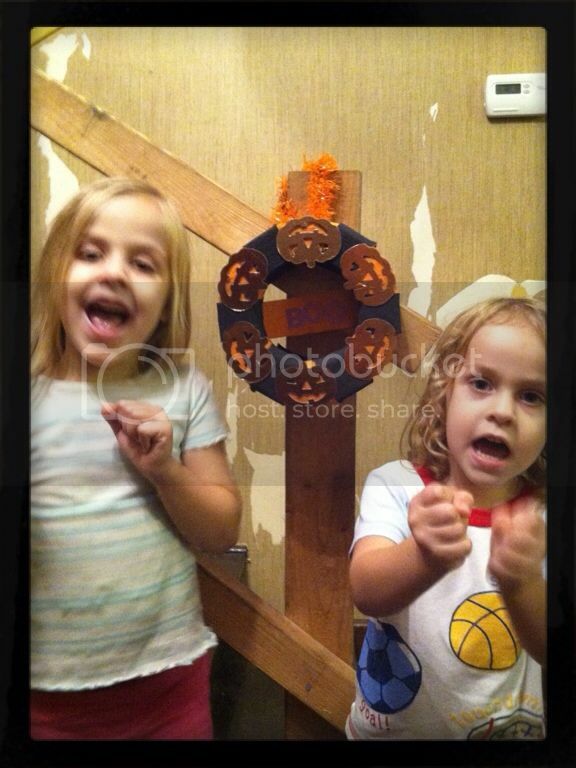 This no Internet beyond my iPhone is makings wonder how life functioned at all before the web! To put it in perspective, I got my first email address in 1995! That means I have had online access for 18 years...nearly half my life and pretty much ALL of my adult life. I know I could go to a fast food place and hop on WiFi but I have a feeling it wouldn't be nearly as productive. I have been putting off work on the foyer for so long. But now the trim is all primed! I ran out of paint so opted to work on the stairs a bit more. 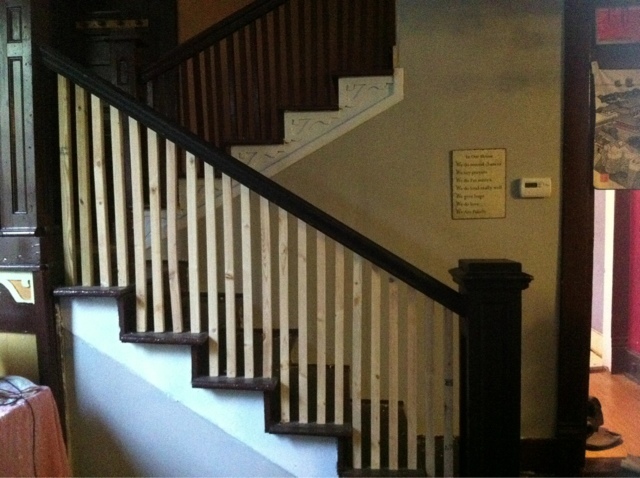 Before, the stair rails consisted of a couple of 2x4s. D and a friend built this for me in February. 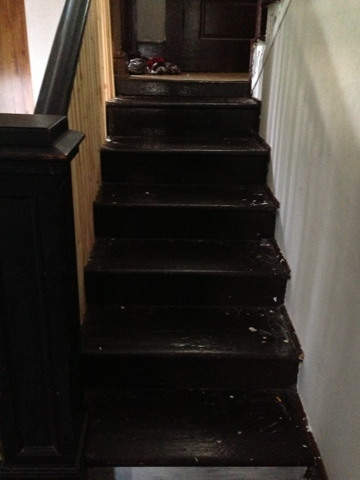 The next step was to prime and paint... Getting rid of the brown on all the stairs! I also primed the risers. It's a big difference already. 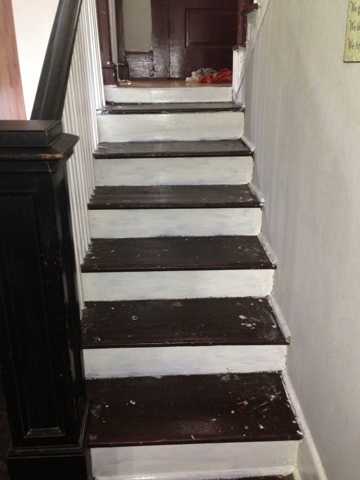 No worries about all the paint drops on the steps... Because I've also started stripping that paint! The goal is to expose the original oak. There are so many layers of paint and its taking forever. It's warm enough that the gel stripper is drying more quickly than I expected. Same issue that I ran in to with the wallpaper removal. I don't expect to finish the steps fully until after the kids are back to school. But, I'm so excited to be at this point after dragging my feet for so long! I love this! Just today I peeked under my carpet and my dreams were confirmed .. there is hardwood! My whole first floor AND stairs! I cant wait until my stairs look half this amazing! Hi, I hopped over from Suzy's party. I love what you are doing with the stairs. I wish I had your energy. I am going to follow along so I can see the finished project. Please hurry along for I am kinda old here! LOL! On behalf of Lisa, Cindy & myself, thanks so much for sharing your links at our "Best Of The Weekend party"! I have pinned both to our party board! You are further along in the progress of your stairs makeover than I am in mine!! It is looking fantastic so far!